Ok what is up with WordPress? Or is it my browser? Or my laptop? I have been trying to post pictures but just cannot. The media uploader doesn’t pop up; and my pop-up blocker isn’t enabled! Darn it, I can’t even access my reader!! I have been sad all day wondering why I can’t post properly. Posting without a picture, however basic the picture may be, is still quite bland. But I guarantee you this dish is not. 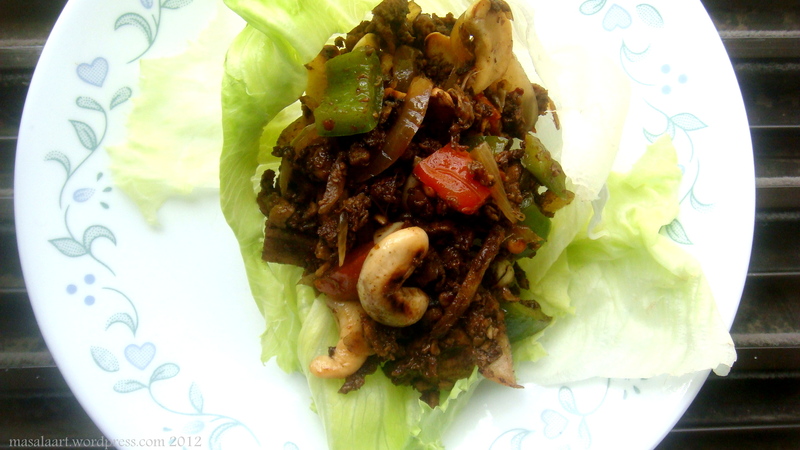 In my last What I Ate Wednesday post, I posted about the Asian chicken lettuce wraps I ate for dinner. I picked up some ground chicken at the market and wanted to make something other than keema curry or chilli. I wanted a cold, spicy chicken salad with Asian flavours. I really enjoy Thai raw papaya, and I love cold Thai beef salad as well. I was toying with minced chicken salad ideas in my head when boom! I remembered seeing pictures of lettuce wraps on The Food Network Website, so I bought a head of lettuce too. I figured if I could season chicken my ground chicken well, and toss it up with soy, it would make a nice Asian-inspired lettuce wrap. These are quite easy to make, and my humble suggestion would be to let the chicken simmer with the lemongrass for a while…this way, that wonderful flavour seeps in and lasts. I ate this for lunch on Thursday too! First, take a large pot and to it, add the ground chicken, enough water, the lemongrass leaves, rice wine vinegar and 2-3 garlic cloves. Cover and allow to simmer on a gentle heat till the chicken is cooked. Next, drain off the water, remove the lemongrass leaves. Keep the chicken and garlic cloves aside. In a wok, heat the oil (I used toasted sesame oil) and allow it to get hot. Add in the garlic you saved from boiling the chicken, the thinly sliced ginger, mushrooms, onions and swish around for about 30 seconds before adding the soy sauce and stir-frying. Next, add in the chicken and cashewnuts and stir-fry for about 2 minutes. Add in the tomatoes, bell peppers, crushed chilli flakes, sugar and salt and stir fry for a minute or so more. You’re done! Allow the chicken to cool in the fridge before placing on washed and dried lettuce leaves. Roll up and enjoy! Hopefully I can figure out why my WP is acting weird. Christmas came and went, and it was so much fun. My best friend came over with her friend, and I decided to make a South Indian dinner. That meant rice and lots of coconut! If you don’t know by now, then I should tell you: food from Kerala will almost always involve coconut. There’s either coconut oil, grated coconut, coconut milk or bits of roasted coconut. 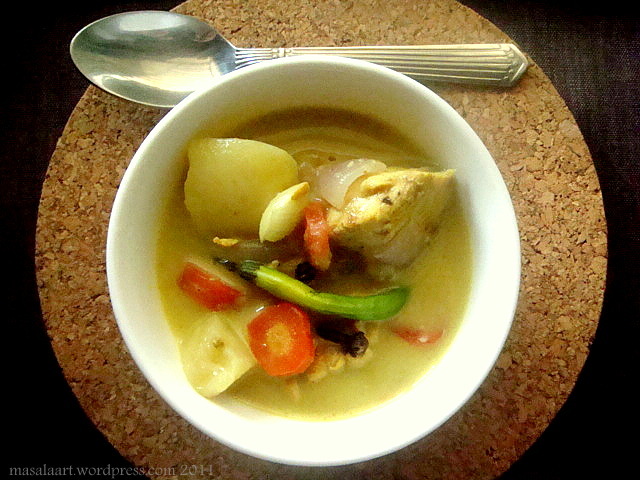 Kerala chicken stew uses coconut milk as a base, and I love it because it is uncomplicated and sits well on any palate. Ideally, I would have liked to serve this with appams or hoppers, but for all my love of Kerala and it’s cuisine, I do not know how to make the batter for appams. I mean, I know how it’s done, but I just haven’t gotten around to doing it. (Note to self- must do so in 2012.) This chicken stew is rather like the fish moilee I made a while ago, the only difference being this does not use tomatoes. You can if you want to, I chose not to. First, combine the chicken, ginger-garlic paste and 1 tablespoon of coconut oil in a medium sized bowl and mix well so that the chicken is coated evenly. Allow the chicken to marinate for at least half an hour. Next, get your spices on. Bring out a large wok, heat the remaining 2 tablespoons of coconut oil and then add all your whole spice(cinnamon+cloves+cardamom+peppercorns,) and swish around till the flavours are released and you have a nice smell in your kitchen. Next, add the ginger, garlic and onions and sautee till they become soft. Now, add your chicken which has been marinating, and sautee some more. Add some salt to taste, and a slit green chilli. Now, add the chopped potatoes and carrots and add some water (about a quarter of a cup cup should do,) and allow to simmer. Once your chicken has been simmering for a few minutes, add the coconut milk, stir around, and allow to cook on a low flame till the chicken is tender. Most other recipes call for fennel and curry leaves, but I didn’t use either because (a) I did not have any fennel and (b) I was also making Thrissur Chicken, which anyway has a lot of curry leaves and I didn’t want everything to taste the same. The trick is to use all your whole spices in proportion- cinnamon and cloves are pretty strong and can really overpower a dish. Small amounts, gentle flavours. This tastes great with rice, appams or plain bread. I will post another Christmas recipe tomorrow soon! I have been making a lot of sweet things lately. My husband likes sweets, but does not adore them and indulge like me, and he has been very patient all these days. But, I knew he was beginning to tire of cookie crumbs and stewed plums. (Yes, I did put that rhyme in there on purpose. On a different train of thought- I think cookie crumbs and stewed plums would actually work quite well together. Note to self- must make.) ANYWAY. I was getting a little bored of drizzling caramel sauce over everything, and I wanted something red, hot and spicy. Chicken it would be. Once, when travelling with my family in Kerala, we stopped at a small highway eatery, where we came across a dish on the menu called Thrissur Chicken. (Thrissur is the name of a town in Kerala.) 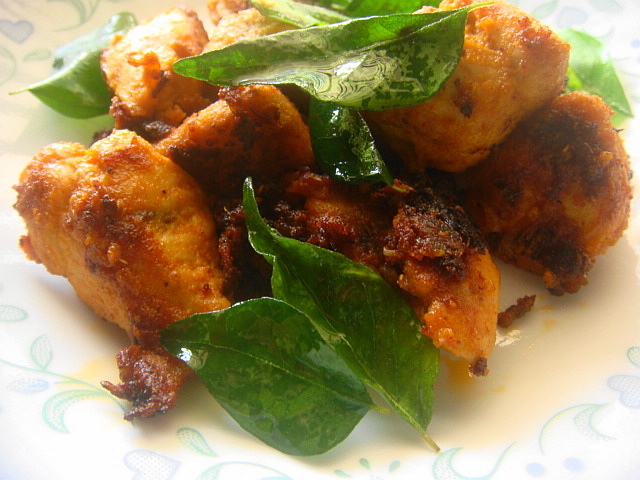 It was fried nuggets of chicken with lots of chilli powder and peanuts, served on a bed of fried curry leaves. It was a fiery red colour and very, very spicy. The spice rub had red chilli powder and coriander for sure, but I suspect the deep red colour came from a small dash of colouring. 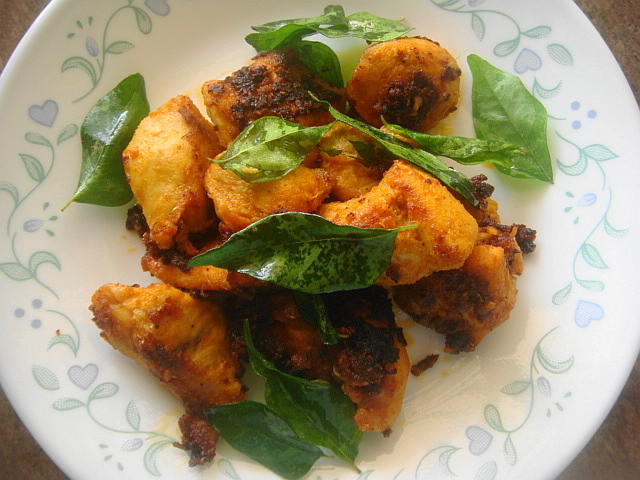 I wanted to make a similar dish, but less spicy and a little sour, so I decided to use red chilli powder and lemon, and finish it off with fried curry leaves for extra flavor and crunch. I don’t know if there is actually a special kind of chicken dish in Thrissur named after the place, but I just took the name and made it my own. This dish turned out great….sharp, spicy, and full of aroma. And the fried curry leaves added such great texture! That’s the thing about curry leaves…they do not get soggy as soon as they come into contact with air. So it remained crispy from mid-morning till 2pm, when we finally ate. Place the chicken in a large bowl. Add the dry ginger powder+chilli powder+coriander powder+1 tablespoon of coconut oil+juice if 1 lime. Grate 3 cloves of garlic into the chicken. Mix everything together with your hands so that the chicken is evenly coated. Allow the chicken to rest in your fridge for at least one hour. Once the chicken has rested, heat the coconut oil in a wok. Once the oil is hot, add the curry leaves and swirl around for approx 30-60 seconds till they are crisp. Remove from oil, drain and keep aside in a separate bowl or plate. Into the same wok, add the marinated chicken pieces and stir-fry till cooked and crispy. You can add some sugar or a little ketchup to caramelize, if you wish. I’ll be honest…this is not the healthiest dish, since it is shallow-fried, but it tastes great. 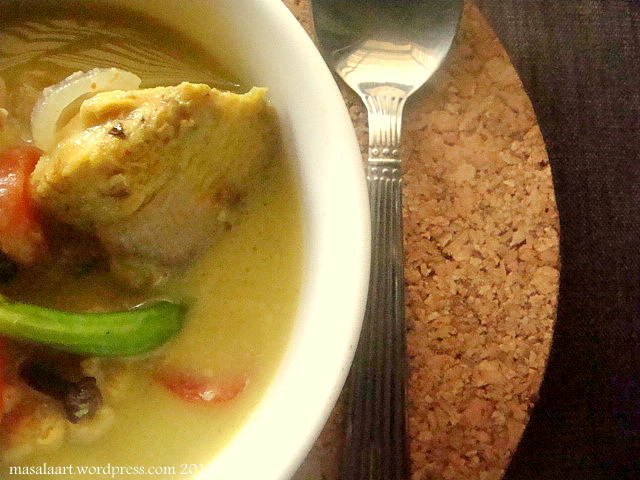 We ate this with steamed rice and dal, but it would go great with rotis too. 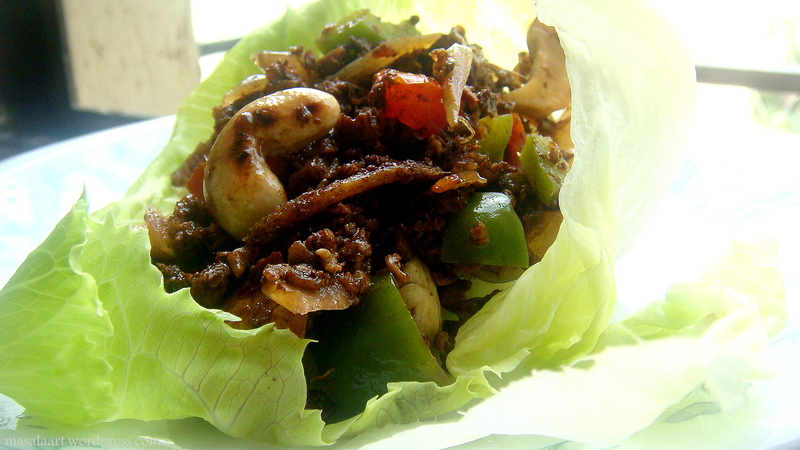 It would even taste nice rolled up in a roti with a dollop of hung curd.